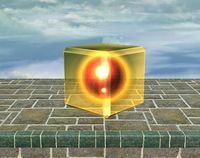 An orange cube is an item found in The Subspace Emissary of the game Super Smash Bros. Brawl. The cubes contain valuable items, like Trophies and healing items, and most will not reappear once the player gets them and re-enters the level. Finding the boxes and getting their treasures is another way to increase the clear percentage. Another variant, called Blue Cubes, also appear and are more common, containing items and occasionally Stickers. This page was last edited on November 19, 2018, at 19:24.